Objectives Previous studies have suggested an important role of the transcription factor Gata6 in endocrine pancreas, while GATA6 haploinsufficient inactivating mutations cause pancreatic agenesis in humans. We aimed to analyse the effects of Gata6 inactivation on pancreas development and function. Design We deleted Gata6 in all epithelial cells in the murine pancreas at the onset of its development. Acinar proliferation, apoptosis, differentiation and exocrine functions were assessed using reverse transcriptase quantitative PCR (RT-qPCR), chromatin immunoprecipitation, immunohistochemistry and enzyme assays. Adipocyte transdifferentiation was assessed using electron microscopy and genetic lineage tracing. Results Gata6 is expressed in all epithelial cells in the adult mouse pancreas but it is only essential for exocrine pancreas homeostasis: while dispensable for pancreatic development after e10.5, it is required for complete acinar differentiation, for establishment of polarity and for the maintenance of acinar cells in the adult. Gata6 regulates directly the promoter of genes coding for digestive enzymes and the transcription factors Rbpjl and Mist1. Upon pancreas-selective Gata6 inactivation, massive loss of acinar cells and fat replacement take place. This is accompanied by increased acinar apoptosis and proliferation, acinar-to-ductal metaplasia and adipocyte transdifferentiation. By contrast, the endocrine pancreas is spared. Conclusions Our data show that Gata6 is required for the complete differentiation of acinar cells through multiple transcriptional regulatory mechanisms. In addition, it is required for the maintenance of the adult acinar cell compartment. Our studies suggest that GATA6 alterations may contribute to diseases of the human adult exocrine pancreas. Gata6 is a transcription factor thought to be mainly involved in endocrine pancreas development. GATA6 haploinsufficient de novo mutations are associated with pancreatic agenesis. We provide evidence that, in mice, Gata6 is not required for the formation of the exocrine or endocrine pancreas but it is essential for normal maturation of acinar cells (full expression of digestive enzymes and normal cell polarity). The effects of Gata6 involve multiple, cooperative, transcriptional regulatory mechanisms. Gata6 is also required for the maintenance of the acinar compartment in the adult pancreas in the absence of damage. Gata6 inactivation favours acinar-to-ductal metaplasia and fat replacement of the pancreas, including epithelial-adipocyte transdifferentiation. However, no evidence of exocrine insufficiency is observed. As previously shown, our findings indicate that massive loss of the acinar compartment can occur in the absence of exocrine insufficiency. Incomplete acinar differentiation may favour plasticity, which in turn may contribute to aggravate pancreatic function. In humans, GATA6 genetic variation may contribute to the development of diseases of the exocrine pancreas. Here, we describe the effects of pancreatic Gata6 deletion at e10.5 using Ptf1a-driven Cre recombinase. 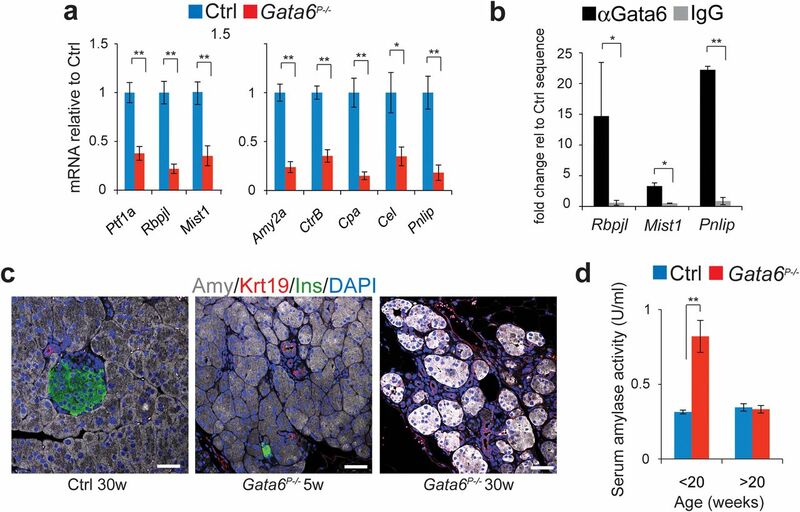 Gata6 is dispensable for pancreas development while it is essential for complete differentiation of acinar cells and for adult exocrine homeostasis. Gata6 inactivation caused massive acinar loss and replacement by fat, including adipocyte transdifferentiation. Gata6 null pancreata also showed persistent acinar-to-ductal metaplasia (ADM). By contrast, we have not found any evidence for a requirement of Gata6 in normal endocrine pancreas function. Mouse strains were: Gata6loxP/loxP,11 Ptf1a-Cre+/KI,12 Rosa26LSL-EYFP.13 Ptf1a-Cre+/KI mice were used as controls, to rule out effects of loss of one Ptf1a allele. Mice were bred and maintained under sterile and pathogen-free conditions. Experiments were approved by the Animal Ethical Committee of Instituto de Salud Carlos III and performed following guidelines for Ethical Conduct in the Care and Use of Animals as stated in The International Guiding Principles for Biomedical Research involving Animals, developed by the Council for International Organizations of Medical Sciences. For Oil-Red-O staining, tissues were fixed in 4% paraformaldehyde, passed through a sucrose gradient, embedded in OCT and snap-frozen. For histopathological analysis, pancreata were fixed in 10% formalin, embedded in paraffin and serially sectioned (3 μm); every 10th section was stained using H&E. Immunostaining followed standard protocols. Primary antibodies were: Gata6 (R&D AF1700, 1 : 1000), Gata4 (C-20 Santa Cruz sc1237, 1 : 2000), α-amylase (SIGMA-Aldrich A8273, 1 : 200), Krt19 (TROMA III Developmental Studies Hybridoma Bank, 1 : 200), Muc1 (CT-1,14 1 : 500), E-Cadherin (BD Laboratories 610182, 1 : 1000), GFP (Roche clones 7.1 and 13.1, 1 : 500), activated-Caspase3 (R&D AF835, 1 : 300), Ki67 (Leica Novocastra, 1 : 1000), perilipin A/B (SIGMA-Aldrich P1873, 1 : 1000). HPRT-conjugated secondary antibodies were from DAKO. For multiple immunofluorescence, species-specific Alexa-conjugated antibodies were used (Invitrogen). Nuclei were counterstained with DAPI. Images were pseudo-coloured using LEICA Application Suite. Tissue fragments of 1–2 mm3 were fixed with 4% glutaraldehyde in Na-cacodylate buffer, postfixed with osmium tetroxide, dehydrated and embedded in Durcupam (Araldit). Toluidine blue-stained sections were used to select areas of interest. Thin sections mounted on grids were stained with uranyl acetate and lead citrate and examined using a Jeol 10.10 electron microscope. Total RNA was extracted from pancreas using guanidine-thyocianate buffer, followed by acid phenol-chloroform. RNA was treated with DNase I (Ambion DNA-free kit, Invitrogen) and converted to cDNA using TaqMan reverse transcription reagents (Applied Biosystems). Quantitative PCR was performed using SYBR-green mastermix in a Prism 7900HT instrument (Applied Biosystems). Primers (online supplementary table S1) were designed using Primer3Plus and reactions were done in triplicate. Quantifications were normalised to endogenous Hprt, using the ΔΔCt method. Pancreatic protein extracts were prepared in Laemmli buffer and sonicated. For SDS-PAGE-western blotting, primary antibodies were: Pparγ (Cell Signalling 2435, 1 : 1000), perilipin A/B (SIGMA-Aldrich P1873, 1 : 800) and β-actin (SIGMA-Aldrich A2228, 1 : 2000). Sections were stained with the In Situ Cell Death Detection Kit (Roche cat 11 684 795 910). Positive nuclei were counted in 20× microphotographs; at least 10 different fields/animal were scored. Glycaemia was determined from tail blood using an automatic glucose monitor. For glucose tolerance tests, 2 g/kg of glucose were injected intraperitoneally and glycaemia was measured at the indicated timepoints. Amylase was measured in serum using Reflotron Pancreatic Amylase tests (Roche). Chromatin immunoprecipitation (ChIP) (8–12-week old Ctrl mice) was performed as described15 using anti-Gata6 (R&D AF1700). Primers are listed in the online supplementary table S1. Data are provided as mean±SEM. Statistical analysis was done using two tailed Student's t-test and p<0.05 was considered significant. All statistical analyses were performed using VassarStat.net. 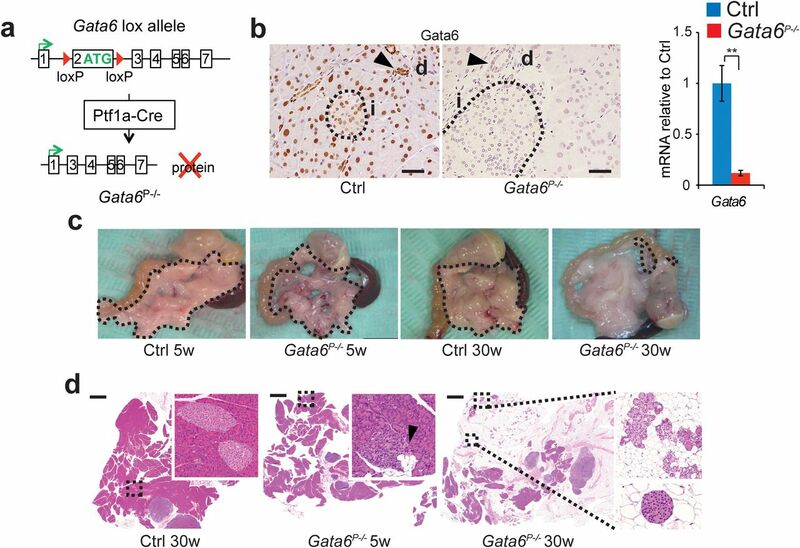 To assess the role of Gata6 in pancreatic development and homeostasis, we generated Gata6loxP/loxP;Ptf1a-Cre+/KI mice (Gata6P−/−) (figure 1A) in which Cre-mediated reporter excision is detected at e10-e10.5.12 Gata6P−/− mice were born at the expected Mendelian frequency and appeared healthy. Gata6 was detected in normal adult acinar, ductal and endocrine cells (figure 1B) and it was efficiently and selectively abrogated in all epithelial cells in Gata6P−/− pancreata (figure 1B and online supplementary figure S1A). Gata6 mRNA levels were 12% of Ptf1a-Cre+/KI control mice (Ctrl) (p=0.003) (figure 1B). Gata6 is dispensable for pancreatic development but is required for the maintenance of the acinar component. (A) Cre recombinase was expressed from the endogenous Ptf1a promoter, active in pancreatic progenitors starting from day e8.5–9. (B) Gata6 expression detected by immunohistochemistry (left) and reverse transcriptase quantitative PCR (right). 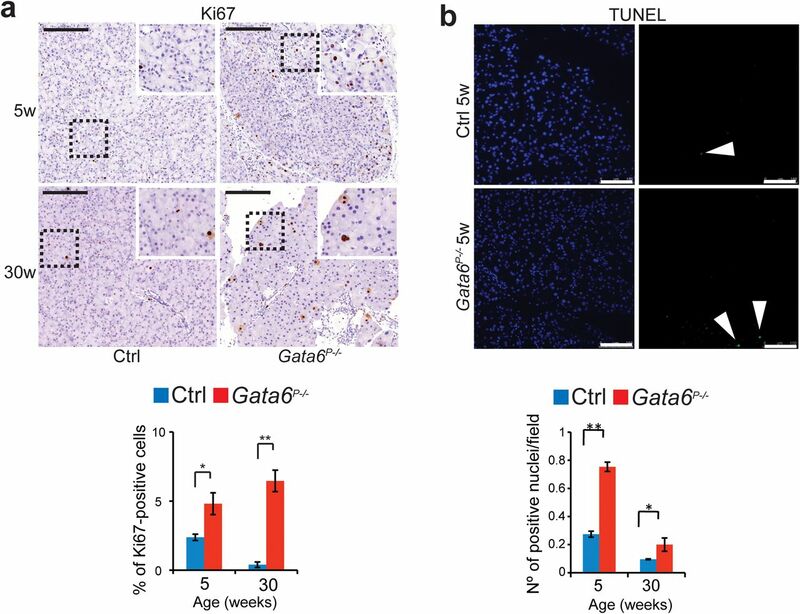 Gata6 is detected in the nucleus of acinar, ductal (arrowheads) and islet (circle) cells in Ctrl mice and is undetectable in all epithelial cells in Gata6P−/− mice. Scale bars: 25 µm. Gata6 mRNA levels are significantly reduced in Gata6P−/− mice (red). (C, D) Gross appearance (C) and H-E staining (D) of control and Gata6P−/− mouse pancreata at 5 and 30 weeks. The pancreas of young Gata6P−/− mice contains isolated metaplastic foci (inset) and focal areas of adipose tissue (arrowhead). Old Gata6P−/− pancreas shows massive atrophy, fat replacement, and mucinous metaplasia (inset). Islets of Langerhans are unaffected (inset). Scale bars: 2 mm. Access the article online to view this figure in colour. Gata6P−/− pancreata were histologically indistinguishable from controls at birth (not shown), indicating that—after e10.5—Gata6 is dispensable for pancreatic development. At 5 weeks, mild oedema, occasional adipocytes and focal ADM were present. Gata6P−/− pancreata became progressively atrophic and by 30 weeks they were almost completely replaced by fat (figure 1C,D). At 30 weeks, massive atrophy, extensive fat replacement, ADM and mucinous metaplasia occurred (figure 1D). A few acinar remnants persisted and islets of Langerhans appeared unaffected (figure 1D). Gata4 expression was preserved in Gata6P−/− pancreata, indicating that Gata4 cannot replace Gata6 in the adult pancreas (online supplementary figure S1B). Despite the dramatic histological changes, Gata6P−/− mice appeared healthy, did not present diarrhoea or steatorrhoea and gained weight as controls, even at old age (>60 weeks) (figure 2A). Basal and fasting glycaemia and response to glucose overload were normal (figure 2B,C), indicating preservation of endocrine function. Effective recombination in endocrine cells was demonstrated using immunohistochemistry with antibodies detecting Gata6 in Gata6P−/− pancreas (figure 1B) and with antibodies detecting EYFP in Rosa26LSL-EYFP;Gata6P−/− (EYFP;Gata6P−/−) pancreas (online supplementary figure S1A). Metabolic studies of endocrine function in Gata6P−/− mice. (A) Weight of Ctrl (black) and Gata6P−/− (grey) mice at different ages. Males and females are shown separately. Data are mean±SEM (Males: n=6 Ctrl, n=9 Gata6P−/−; females: n=7 Ctrl, n=6 Gata6P−/−) *p<0.05 (Student t-test). 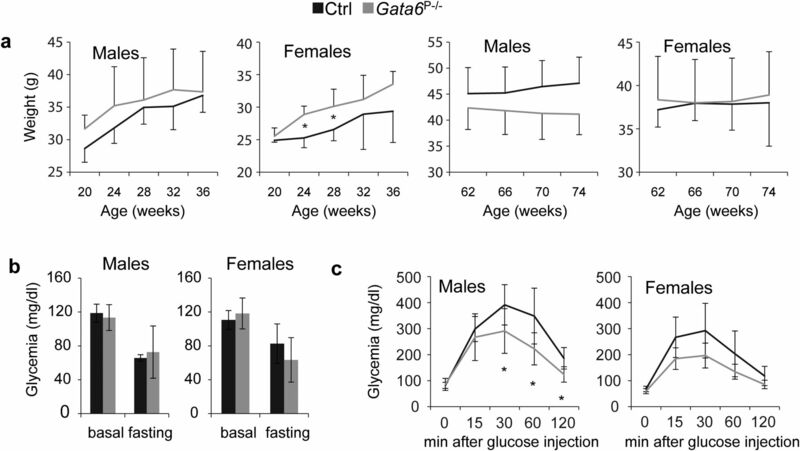 (B) Glycaemia of Ctrl (black) and Gata6P−/− (grey) mice in basal conditions and after 24 h of fasting. Males and females are shown separately. Data are mean±SEM (Males: n=3 Ctrl, n=13 Gata6P−/−; females: n=3 Ctrl, n=14 Gata6P−/−). (C) Glycaemia after intraperitoneal glucose injection, both in Ctrl (black) and Gata6P−/− (grey) mice. Males and females are shown separately. Data are mean±SEM (Males: n=6 Ctrl, n=8 Gata6P−/−; females: n=5 Ctrl, n=6 Gata6P−/−) *p<0.05 (Student t-test). To assess the exocrine function in more detail, we used RT-qPCR. Ptf1a and Rbpjl encode the tissue-specific components of Pancreas Transcription Factor 1 (PTF1), a master regulator of acinar differentiation.15 A significant reduction of their transcripts was observed in 8-week-old Gata6P−/− mice (38% and 22% of controls, respectively; p<0.01 and p<0.001) (figure 3A). mRNA levels of PTF1 target genes coding for digestive enzymes (Amy2a, CtrB, CpA, Pnlip) were also significantly reduced (24%, 35%, 15%, 18% of controls, respectively; p<0.01, all comparisons) (figure 3A); such reduction cannot be explained by the mild atrophy observed at this age (figure 1D). ChIP experiments showed Gata6 binding to Rbpjl and Pnlip promoters, indicating that Gata6 is a novel regulator of the acinar programme (figure 3B). The few remaining acinar cells in 30-week-old Gata6P−/− pancreata showed stronger immunostaining of amylase, CpA, and CtrB1 than controls and contained large granules loaded with digestive enzymes (figure 3C and supplementary figure S2A). Serum amylase levels were significantly higher in young (<20 weeks) Gata6P−/− mice than in controls (2.6-fold increase, p<0.001); these differences disappeared in older mice (figure 3D) despite the dramatic loss of exocrine tissue, suggesting abnormal secretion. To assess polarity we analysed expression of apical Muc1 and of basolateral E-cadherin. These proteins showed a mutually exclusive expression pattern in control mice whereas they showed partial colocalisation and intracellular accumulation in young Gata6P−/− mice, indicating altered apico-basal polarity (online supplementary figure S2B) which contribute to a higher leakage of digestive enzymes into plasma. Mist1 is necessary for full maturation and polarity of acinar cells16: Mist1 mRNA and protein levels were significantly reduced by 8 weeks in Gata6P−/− mice (38% of Ctrl, p=0.003; figure 3A and online supplementary figure S2C) and ChIP confirmed that Gata6 binds the Mist1 promoter (figure 3B). These findings indicate that Gata6 is required for normal acinar differentiation and enzyme secretion and for the maintenance of the acinar compartment in the adult. Multiple mechanisms contribute to this phenotype including regulation of PTF1 complex components and Mist1, and direct regulation of digestive enzyme gene promoters. Incomplete differentiation and defective acinar function in the pancreas of Gata6P−/− mice. (A) Expression of PTF1 components (Ptf1a and Rbpjl), Mist1 and PTF1 target genes (Amy2a, CtrB, CpA, Cel, Pnlip) detected by reverse transcriptase quantitative PCR in Ctrl (blue) and Gata6P−/− (red) mice. Data are mean±SEM (n=7 Ctrl, n=9 Gata6P−/−) *p<0.05, **p<0.01 (Student's t-test). (B) Binding of Gata6 to the promoter of Rbpjl, Mist1 and Pnlip (Chromatin Immunoprecipitation-qPCR). Data are referred as fold increase over a non-related sequence. Data are mean of three independent experiments±SEM *p<0.05 **p<0.001 (Student's t-test). (C) Expression of amylase (Amy, acinar), cytokeratin 19 (Krt19, ductal) and insulin (Ins, endocrine), detected by immunofluorescence in sections of a 30-week-old Ctrl mouse (left), compared with a 5-week-old (centre) and a 30-week-old (right) Gata6P−/− mouse. Nuclei were counterstained with DAPI. Images were obtained by multiphoton confocal microscopy using the same settings, in order to allow comparison. Scale bars: 50 μm. (D) Serum amylase activity in Ctrl (blue) andGata6P−/− (red) mice. Results shown as mean±SEM Ctrl: <20 weeks (n=14), >20 weeks (n=21); Gata6P−/−: <20 weeks (n=18), >20 weeks (n=15). **p<0.01 (Student's t-test). Access the article online to view this figure in colour. To examine the mechanisms leading to the massive acinar loss, we assessed proliferation, apoptosis, autophagy and differentiation. Gata6P−/− pancreata showed significantly more Ki67+ acinar cells than controls both at 5 (2.0-fold, p=0.026) and 30 weeks (16.1-fold, p=0.004) (figure 4A); comparable results were obtained for BrdU uptake (not shown). Apoptosis was measured using TUNEL: while low, the number of apoptotic nuclei increased significantly both at 5 (2.75-fold, p=0.006) and at 30 weeks (2.09-fold, p=0.002) in Gata6P−/− mice (figure 4B). Similar results were obtained by immunostaining for activated Caspase3 (not shown). There were no differences in LC3+ cells, indicating that autophagy does not play a major role in acinar atrophy (not shown). Gata6P−/− pancreatic acinar cells display increased proliferation and apoptosis. 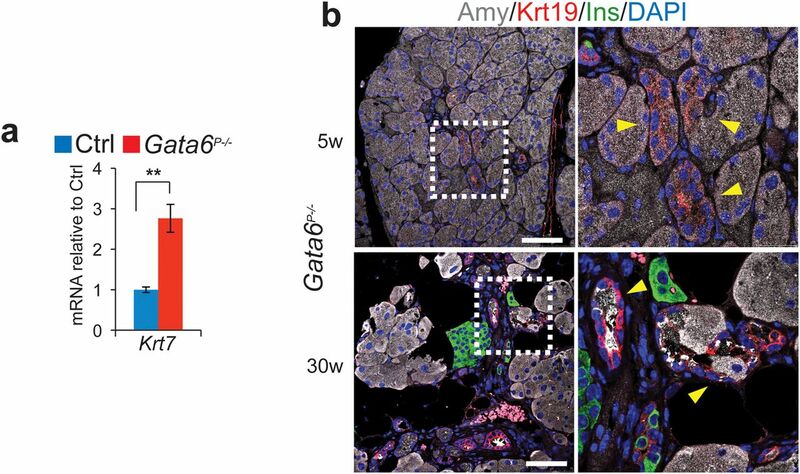 (A) Expression of Ki67 detected by immunohistochemistry in pancreas sections from 5 and 30-week-old Ctrl and Gata6P−/− mice. Higher magnification of a detail is shown in the insets. Scale bars: 200 μm. Lower panel: Quantification of Ki67+ acinar cells in Ctrl (blue) and Gata6P−/− (red) pancreata at the indicated ages. Results are mean±SEM (n=4) *p<0.05, **p<0.01 (Student's t-test). (B) TUNEL assay in pancreas sections of 5-week-old Ctrl and Gata6P−/− mice. Apoptotic nuclei were labelled in green and nuclei were counterstained with DAPI. Scale bars: 200 μm. Lower panel: quantification of positive nuclei (arrowheads), performed as indicated in Methods (n=3 mice per group) *p<0.05, **p<0.001 (Student's t-test). Access the article online to view this figure in colour. The most striking histological feature of Gata6P−/− pancreata was a massive accumulation of fat. Ultrastructural analysis at 8 weeks showed the presence of lipid droplets in acinar cells (figure 5A). Lipid droplet-containing E-cadherin+ acinar cells and amylase-expressing adipocytes were also identified at 15 weeks (figure 5B). 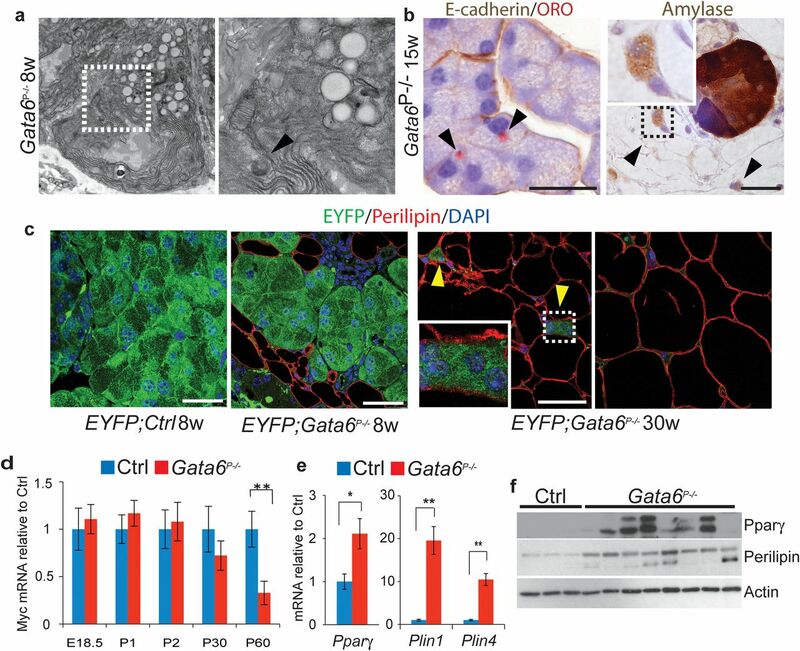 To genetically trace adipocytes, we used EYFP;Gata6P−/− mice: at 8 weeks, cytoplasmic and nuclear EYFP was detected in all epithelial cells (figure 5C). At 30 weeks, adipocytes co-expressing EYFP and the lipid droplet marker perilipin were observed (figure 5C), indicating that some adipocytes have an epithelial origin. By contrast, EYFP was never detected in the mesenteric white adipose tissue of EYFP;Gata6P−/− mice (figure 5C) or in the fat surrounding Rosa26LSL-EYFP;Ptf1a-Cre+/KI control pancreata (not shown). Transdifferentiation of acinar cells into adipocytes has been described in MycP−/− mice.17 Myc mRNA levels were reduced in Gata6P−/− pancreata at 8 weeks (34% of controls, p=0.002; figure 5D) and adipocyte marker expression was detectable prior to the reduction of Myc. In addition to Myc downregulation, other mechanisms may contribute to the adipocyte transdifferentiation observed in Gata6P−/− pancreata. Upregulation of the master adipogenesis regulator Pparγ (2.1-fold, p=0.021) and its targets Plin1 and Plin4 (19.6-fold, p<0.001; 10.4-fold, p<0.001, respectively) was detected by 8 weeks (figure 5E). Increased expression of Pparγ and perilipin proteins was confirmed (figure 5F). Gata6P−/− pancreatic epithelial cells undergo adipocyte transdifferentiation, demonstrated by genetic lineage tracing. (A) Ultrastructural analysis of an 8-week-old Gata6P−/− pancreas shows lipid droplets inside of an acinar cell containing abundant RER. Arrowhead points to a zymogen granule. Magnification: left ×10 000; right ×40 000. (B) Left: lipid droplets (arrowheads), stained with Oil-Red-O, in E-cadherin+ acinar cells in a 15-week-old Gata6P−/− mouse. Right: amylase-containing zymogen granules in the cytoplasm of adipocytes (arrowheads) in the same mouse. Scale bars: 25 μm. (C) Expression of EYFP and perilipin in pancreas sections of 8-week-old EYFP;Ctrl (first) and EYFP;Gata6P−/− (second) mice. Third: EYFP expression in perilipin-expressing adipocytes in a EYFP;Gata6P−/− pancreas at 30 weeks (arrowheads). Last: lack of EYFP in white adipose tissue from the same mouse. Nuclei were counterstained with DAPI. Scale bars: 25 μm. (D) Myc mRNA expression levels in the pancreas of Ctrl (blue) and Gata6P−/− (red) mice of the indicated ages, detected by RT-qPCR. E: embryonic; P: postnatal. Data are presented as relative to Ctrl and are mean±SEM (at least four mice per group were analysed) **p<0.01 (Student's t-test). (E) Reverse transcriptase quantitative PCR analysis of adipocyte markers Pparγ, Plin1, and Plin4 in Ctrl (blue) and Gata6P−/− (red) pancreata at 8 weeks. Results are mean±SEM (n=7 Ctrl, n=9 Gata6P−/−). *p<0.05, **p<0.01 (Student's t-test). (F) Expression of Pparγ and perilipin A/B in Ctrl and Gata6P−/− pancreata at 8 weeks, detected by western blotting. Actin was used as loading control. Access the article online to view this figure in colour. ADM, a process whereby acinar cells dedifferentiate and acquire ductal features,18 was also prominent in Gata6P−/− mice (figure 1D). Accordingly, in 8-week-old mice reduced levels of digestive enzyme transcripts (figure 3A) were accompanied by increased Krt7 (ductal-specific) mRNA levels (2.8-fold, p=0.001) (figure 6A). Lineage tracing could not be used to assess the acinar origin of ductal-like cells in Gata6P−/− pancreata because the Ptf1a-driven Cre recombinase is active in common precursors. Intermediate cells co-expressing amylase (acinar-specific) and Krt19 (ductal-specific) were found in Gata6P−/− pancreata after 5 weeks and were frequent at 30 weeks (figure 6B). We therefore conclude that apoptosis, adipocyte transdifferentiation, and ADM contribute to acinar cell loss. Increased acinar proliferation suggests a compensating response. Gata6P−/− pancreata display acinar-to-ductal metaplasia. (A) Reverse transcriptase quantitative PCR analysis of the ductal marker Krt7 in Ctrl (blue) and Gata6P−/− (red) pancreata at 8 weeks. Results are mean±SEM (n=7 Ctrl, n=9 Gata6P−/−). **p<0.01 (Student's t-test). (B) Expression of amylase (Amy), cytokeratin19 (Krt19), and insulin (Ins) in Gata6P−/− pancreata at 5 (upper panel) and 30 (lower panel) weeks. Intermediate cells (arrowheads) co-expressing amylase and Krt19 are shown. Scale bars: 50 μm. Higher magnification of the highlighted region is shown next to each image. Access the article online to view this figure in colour. We demonstrate here that Gata6 is dispensable for pancreas development after e10–e10.5 but is critical for complete acinar differentiation and for the maintenance of acinar cells in the adult pancreas. Unlike proposed,6 Gata6 is dispensable for endocrine differentiation and function after e10.5. The fact that Gata6 is dispensable for exocrine pancreas formation but is required for its maintenance indicates the existence of active mechanisms promoting cell survival. The integrity of such mechanisms is necessary for tissue homeostasis in the adult, where cell proliferation is very low, and during aging. Furthermore, the hyperproliferation observed cannot sustain tissue integrity. The finding that Gata6 is dispensable for pancreas development in this mouse model is not at odds with the pancreatic agenesis observed in patients with GATA6 haploinsufficient mutations.10 This difference suggests that type of mutation, timing and tissue-specificity of Gata6 ablation—among others—account for this phenotype: Cre recombinase driven from the Ptf1a locus is expressed selectively in the pancreas shortly after locus activation, whereas GATA6 mutations in patients can affect endoderm development at earlier time points. Full differentiation of pancreatic acinar cells implies abundant expression of digestive enzymes, the establishment of apico-basal polarity, and tightly regulated exocytosis.19 We reveal novel roles of Gata6 in all these processes through direct activation of PTF1 components, binding to digestive enzyme gene promoters, and regulation of cell polarity and exocytosis at least in part through Mist1. Gata6 therefore adds to the list of transcription factors that are required for the fine-tuning of acinar differentiation while not being essential for acinar cell formation. Among these are Mist1,16 Xbp1,20 Nr5a2,21 and Hnf1a.22 A striking feature of the phenotype of Gata6P−/− mice is the lack of overt exocrine insufficiency when fed a normal diet. This observation further supports the notion that the exocrine pancreas has a wide functional reserve and that major changes in acinar cell function may not be clinically evident. This finding has broad implications regarding the recognition of both chronic pancreatitis and exocrine insufficiency in patients when assessing genotype-phenotype correlations. ADM, which was also present in the pancreas of Gata6P−/− mice, can be activated in vitro and in vivo upon stress18 and it is an initial step of mutant KRas-driven tumorigenesis.31 ,32 Persistent ADM is associated with increased proliferation in mutant KRas knock-in mice31 and may play a role in the hyperproliferation observed in Gata6P−/− mice. GATA6 has been proposed to participate in the development of ductal adenocarcinoma (PDAC) in humans.33–35 Low GATA6 expression identifies a subset of PDAC characterised by quasi-mesenchymal features and resistance to KRAS knockdown.36 In addition, GATA6 participates in Wnt pathway regulation in this tumour.37 The mouse models reported here may provide clues about the mechanisms involved therein. It will also be important to determine whether genetic variation in GATA6 is associated with diseases of the exocrine pancreas in humans. The authors thank E. Batlle, M. Barbacid, M.C. Guerra, P. Herrera and M. Serrano for valuable contributions, and Y. Cecilia A. Cortés for technical help, CNIO core facilities for support, and investigators who provided reagents or mice.
. Further extension of mammalian GATA-6. Dev Growth Differ 2005;47:591–600.
. GATA-6 is required for maturation of the lung in late gestation. Am J Physiol Lung Cell Mol Physiol 2002;283:L468–75.
. GATA6 is essential for embryonic development of the liver but dispensable for early heart formation. Mol Cell Biol 2005;25:2622–31.
. Loss of both GATA4 and GATA6 blocks cardiac myocyte differentiation and results in acardia in mice. Dev Biol 2008;317:614–19.
. GATA6 regulates HNF4 and is required for differentiation of visceral endoderm in the mouse embryo. Genes Dev 1998;12:3579–90.
. Gata6 is an important regulator of mouse pancreas development. Dev Biol 2006;298:415–29.
. Transcription factor GATA-6 is expressed in the endocrine and GATA-4 in the exocrine pancreas. Mol Cell Endocrinol 2004;226:51–7.
. The zinc finger-containing transcription factor Gata-4 is expressed in the developing endocrine pancreas and activates glucagon gene expression. Mol Endocrinol 2005;19:759–70.
. The human GATA-6 gene: structure, chromosomal location, and regulation of expression by tissue-specific and mitogen-responsive signals. Genomics 1996;38:283–90.
. GATA6 haploinsufficiency causes pancreatic agenesis in humans. Nat Genet 2011;44:20–2.
. Generation of mice harbouring a conditional loss-of-function allele of Gata6. BMC Dev Biol 2006;6:19.
. Antibodies to the cytoplasmic domain of the MUC1 mucin show conservation throughout mammals. Biochem Biophys Res Commun 1992;185:167–75.
. PTF1 is an organ-specific and Notch-independent basic helix-loop-helix complex containing the mammalian Suppressor of Hairless (RBP-J) or its paralogue, RBP-L. Mol Cell Biol 2006;26:117–30.
. Pancreatic inactivation of c-Myc decreases acinar mass and transdifferentiates acinar cells into adipocytes in mice. Gastroenterology 2009;136:309–19 e9.
. Pancreatic ductal adenocarcinoma and acinar cells: a matter of differentiation and development? Gut 2012;61:449–58.
. Transcriptional control of acinar development and homeostasis. Prog Mol Biol Transl Sci 2010;97:1–40.
. Extensive pancreas regeneration following acinar-specific disruption of Xbp1 in mice. Gastroenterology 2011;141: 1463–72.
. Lineage tracing and characterization of insulin-secreting cells generated from adult pancreatic acinar cells. Proc Natl Acad Sci USA 2005;102:15116–21.
. Molecular basis of transdifferentiation of pancreas to liver. Nat Cell Biol 2000;2:879–87.
. p53-dependent regulation of growth, epithelial-mesenchymal transition and stemness in normal pancreatic epithelial cells. Cell Cycle 2011;10:1312–21.
. GATA proteins work together with friend of GATA (FOG) and C-terminal binding protein (CTBP) co-regulators to control adipogenesis. J Biol Chem 2010;285:32405–14.
. GATA transcription factors and fat cell formation. Drug News Perspect 2003;16:585–8.
. Noninvasive quantification of pancreatic fat in healthy male population using chemical shift magnetic resonance imaging: effect of aging on pancreatic fat content. Pancreas 2011;40:295–9.
. Lipotoxicity causes multisystem organ failure and exacerbates acute pancreatitis in obesity. Sci Transl Med 2011;3:107ra110.
. Frequent genomic copy number gain and overexpression of GATA-6 in pancreatic carcinoma. Cancer Biol Ther 2008;7:1593–601.
. Genomic profiling identifies GATA6 as a candidate oncogene amplified in pancreatobiliary cancer. PLoS Genet 2008;4:e1000081.
. Genome profiling of pancreatic adenocarcinoma. Genes Chromosomes Cancer 2011;50:465–65.
. Subtypes of pancreatic ductal adenocarcinoma and their differing responses to therapy. Nat Med 2011;17: 500–3.
. GATA6 activates WNT signalling in pancreatic cancer by negatively regulating the Wnt antagonist Dickkopf-1. PLoS One 2011;6:e22129. Contributors PM: designed and performed most of the experiments, analysed data, wrote the paper. MC: performed experiments and contributed to data analysis. NdP: provided technical support and performed experiments. FM: performed experiments and analysed data. AZ: performed experiments and analysed data. FXR: directed the research, contributed to experimental design, data analysis, wrote the paper and obtained financial support. Funding This work was supported, in part, by grants SAF2007-60860, SAF2011-29530 and ONCOBIO Consolider from Ministerio de Ciencia e Innovación (Madrid, Spain) and grant 256974 from European Union Seventh Framework Programme to FXR. PM is recipient of a Juan de la Cierva grant from Spanish Ministry of Science and Innovation and FM is recipient of a La Caixa PhD Fellowship. Data sharing statement The authors would be glad to share the detailed experimental results included here as well as data not shown reported in the text with other scientists upon their written request to the corresponding author.